Alfa Flexitubes design and supply a complete range of flexible hose assemblies that are used in a multitude of applications such as tank trucks, steam generation, gas separation, refiniries, steel plants and more. Our offering include a wide range of metallic (stainless steel) flexible hose assemblies, complete with end connectors of stainless steel, copper, carbon steel and brass. The range of standard end connectors include screwed fittings (male and female), flanged fittings of any standard fix as well as swivel type, welding stubs, cam lock coupling and more. 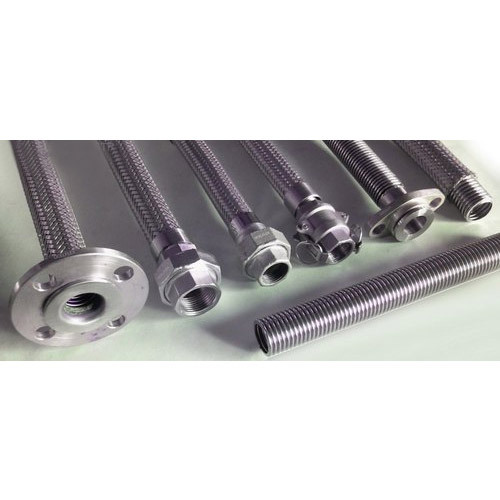 We can supply flexible hose assembly with special end fittings as per customer's drawings and requirements. We have a team of highly experienced engineers who can assist in designing the assemblies for a variety of applications and critical installation. Alfa stocks all kinds fittings like Camlock Couplings, QRC, Male fittings, Female fittings, Flange and we make non-standard fittings as per order. Metal bellows are generally used in pipeline systems, which connect the pumps and vessels. The design of the folds in metal bellow permits greater axial, lateral, and angular movements. To increase the angular or lateral flexibility, the ties, pivots or other trimmings can be added to a metal bellow. The service life of these devices is determined on the basis of shape, material and degree to which the junction must be able to move, and of course, forces that are more than the designed limits. We design and supply Single Ply as well as Multi-ply bellows membranes and expansion joints in various sizes ranging from 20 mm to 2000-mm nominal diameter. The bellows in sizes of 20 mm to 300 mm are fabricated using the hydraulic process while higher diameter is made using the roll forming. Using these bellows, flanged-end and fused-end expansion joints can be easily and smoothly fabricated. Both universal as well as double expansion joints uses two bellows. Our bellows are designed as per the EJMA Standards, however, we are capable to design these with customization to suit specific customer specifications. We have a standard range of single ply bellows for uses in engine exhaust applications as well as general-purpose and low-pressure applications. The quality metal expansion joints supplied by us have found crucial applications in pipeline technology and are used to counterbalance length changes, which generally occur in pipelines due to temperature changes. Besides this, the metal expansion joints are capable of absorbing the vibrations developed from pumps, engines, compressors or turbines. Depending on the problem, the axial, lateral as well as angular movements can be compensated. Metal expansion joints provide cost advantage and increase the service life of a pipeline system.